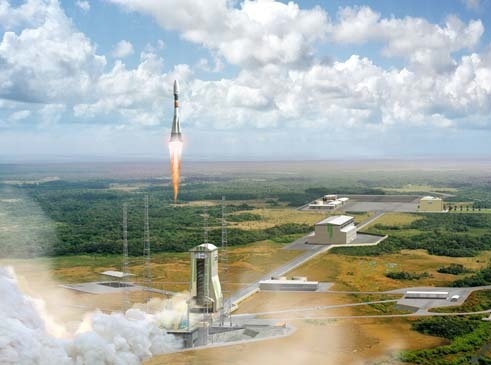 Artist’s impression of a Soyuz launch from Korou (Credits: ESA). Source ESA: International space cooperation will be highlighted in a historic event on 20 October: the launch of Europe’s first Galileo navigation satellites on Russia’s first Soyuz rocket to depart from Europe’s Spaceport in French Guiana. Liftoff is scheduled for Thursday, 20 October at 12:34 CEST (11:34 GMT, 07:34 local time). The launch will be the first time that Russia’s venerable Soyuz vehicle has ascended from European territory, adding a trusted workhorse to Europe’s launchers family. This Soyuz-2 version is the latest in the renowned family of Russian rockets that began the space race more than 50 years ago by carrying both the first satellite, Sputnik, and the first man, Yuri Gagarin, into space. Riding Soyuz will be the first two operational satellites in the Galileo constellation that will provide Europe with an independent global satellite navigation system. Media can follow this important event live at one of the many launch events being organised around Europe, via satellite for broadcasters or on the web. I don’t think french guiana can be properly called “european territory”, it’s located in south america.